In Spanish we can find different slang vocabulary which are fun to learn and in some ways can make your language ability sound more natural to the native listener. In today’s post, I’ll go over some of the common Spanish slang vocabulary you’re likely to come across if you ever decide to visit some of the South American Spanish-speaking countries. Iremos a la playa la próxima semana, será bakán. We’re going to the beach next week, it’s going to be epic. Hay caleta de gente en el supermercado. There’s a ton of people at the supermarket. Me gusta la Carla, pero quédate piola. I like Carla, but keep it Low-key. Just before I give you an example, bear in mind that Mino can refer to either a man or a woman. Also, depending on the context can also refer to a young woman or young man. El Pedro es super mino. Esa vaina es muy cara. That thing is too expensive. Que vaina, no alcanzas a llegar. What’s your problem, you can’t arrive on time? The official definition for boleta in the dictionary is ticket. However, in Colombia it can mean “an embarrassing situation” (or a sad situation). Ese baile que presentaste fue super boleta. That dancing performance that you did was sad. Come here and eat, boy. Done! 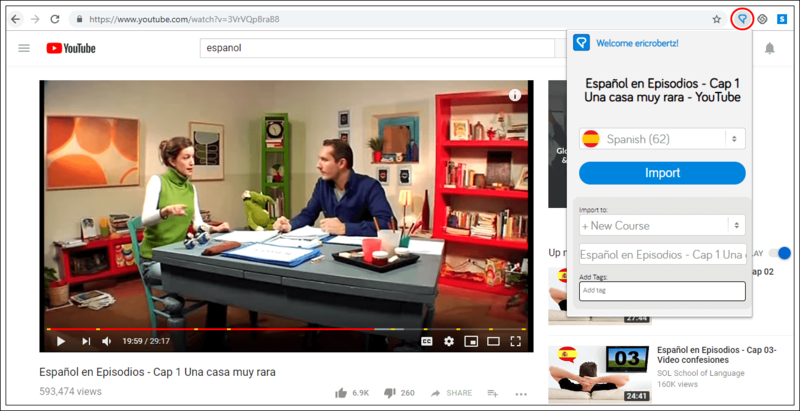 Open LingQ and you now have the video, a clear and easy-to-read transcript, as well as the ability to look-up and save new vocabulary. All of this in one place so you don’t get distracted. Please note, the video’s audio won’t import right away as there is a little delay. Once you’ve imported some videos, you can even study them on the go using LingQ’s mobile app (available on both Android and iOS). After you open your lesson, you’re good to go. Don’t forget to highlight new words you come across (in blue) so you can review them in LingQ at a later date. You can do this with any YouTube video as long as their are captions 🙂 If you are looking for a better way to study, check out LingQ today! Claudia Ramos is a Chilean Teacher of English who dedicates herself to study different languages. She can speak Spanish, Portuguese and Mandarin Chinese. All of them in different levels. Also, Claudia teaches Spanish to people from different parts of the world via Skype.